It was a mother’s worst nightmare: Your son has severe, flu-like symptoms and an uncontrolled nosebleed that, you learn, is the result of a life-threatening illness. You are new to the community and don’t know where to turn for care. ABOVE: NorthBay Healthcare’s highly trained oncology staff, including Carolyn Bailey, R.N., and James Long, M.D., make it possible for leukemia patients like Ricky Kirk to get early treatment in Vacaville, rather than have to travel to San Francisco or Sacramento. Fortunately for the Kirk family, a move to Vacaville brought them close to NorthBay VacaValley Hospital and the NorthBay Cancer Center, where they were able to get the chemotherapy treatment son Ricky needed to battle his acute lymphoblastic leukemia, without the added stress of having to travel far from home. Only later would she learn just how fortunate that would be for Ricky. Leukemia is a cancer of the bone marrow and blood, and it progresses rapidly without treatment. The first line of defense—called induction—uses two kinds of chemotherapy to destroy normal bone marrow cells along with the cancerous ones. Ricky spent all of August and part of September in VacaValley Hospital, first to battle infections with antibiotics and then to undergo intensive infusions. Now in remission, Ricky was ready to receive a bone marrow transplant with donated marrow from a family member. The procedure was performed at U.C. Davis Medical Center in February. When he came home, he went into isolation for 100 days to avoid chance encounters with animals, colds or flus, or anything that might challenge his weakened immune system. 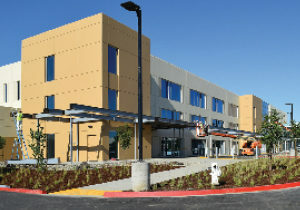 NorthBay Cancer Center, 1020 Nut Tree Road, offers a coordinated and comprehensive program of cancer prevention, detection, treatment, rehabilitation and support services, through its medical oncology and radiation oncology services. Chemotherapy and biotherapy treatments are administered using the highest level of care by the staff of oncology-certified nurses and other clinical staff. Radiation therapy—with the center’s new, state-of-the-art Varian TruBeam linear accelerator—kills or shrinks cancer cells using an advanced image-guided radiation therapy system, while avoiding healthy tissues and organs, and is particularly useful for complex cancers of the lung, breast, head, neck, prostate and brain. In addition to the linear accelerator, the Cancer Center has an array of advanced imaging, through Solano Diagnostics Imaging, which is also located in the VacaValley Wellness Center. They include digital mammography, MRI, ultrasound, 3D mammography, MRI-guided breast biopsy, CT, PET scans and X-ray services. Nurse navigators guide and support patients and their families through the diagnosis, treatment and recovery process, as they are available to answer questions, organize test results and expedite appointments. A genetic counselor helps patients understand how their family history may predispose them to developing certain kinds of cancers, and social services and other support staff help patients manage not only physical, but emotional and financial aspects of a cancer diagnosis. The NorthBay Pharmacy, located in the Cancer Center, offers a range of specialty medications that can be filled on-site during a patient’s appointment.